One of the hardest parts about moving out of your house to a new one is the part where you have to transfer items and belongings that you have been gathering over the years. This makes moving a bit of a hassle, especially in a situation where you decide not to hire any movers and choose to do everything by yourself. 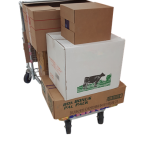 Packing items into boxes, moving from room to room to add more items and eventually moving all the packed boxes out into a van or some other form of transportation is not easy, and you will need quite a bit of help. This is the part where Uboxes comes in. As you can probably already guess from the name, Uboxes as a brand deal with providing moving kits, boxes and supplies on sale to people who need them. In this piece, we will be taking a look at a particular category – Uboxes moving kits. Uboxes has a store for moving kits of various types and functions. These moving kits are built to make moving a less daunting task. Particularly, in a situation where you are moving out of a big house and have a lot of packing to do, Uboxes' moving kit is just what you need. A complete Uboxes mover kit is designed to provide all the things that will make your move easier. Each kit contains useful tools such as house boxes, packing tape, packing paper, bubble wrap, a marker and a blanket bag. Uboxes can provide moving kits for up to ten rooms, which is likely to be more than enough to have you covered. If you need bigger kits or kits specially built for specific purposes, they can be made available (and in bigger boxes too!). What’s more, if none of the available moving kits suits the purposes that you require them for, then all you have to do is make a custom order. Place a request stating exactly what you need, and the quantities that you need. This may not even be necessary though, as there are up to forty different moving kits for you to choose from already. Uboxes recognizes the fact that people have different needs and preferences when it comes to moving supplies. So, instead of building a sort of “one size fits all” package, they have tried to create varying package types with the hopes of satisfying the needs of as many customers as possible. While the “one size fits all” may be better for marketing, the actual need of the customer is obviously a key factor in the decision-making process involved in building these moving kits. For customers that are looking to move out of a big house, Uboxes’ moving kit should be the first thing that you purchase. You have a wide selection to pick from, and you are covered for a high number of rooms. There’s that custom order if you want something a little extra too! You can check this page out for detailed information about the kits, and there’s a toll-free customer service number on there that you can reach out to if you have questions. Make a move now!